The Bulls still remain tied with Toronto for third in the Eastern Conference and two and a half games ahead of fifth place Brooklyn. These Bulls will never be labeled soft, though rarely confused with a highlight film. They are known to wear opponents down, grind, as the basketball talk goes, make plays and relentlessly hit the boards. That latter part hasn’t always been there of late, though the Bulls had an efficient game Wednesday with 51.3 percent shooting against an Atlanta team now tied for the last playoff spot in the East with the Knicks. The Bulls were sharp with 27 assists on 40 field goals and matching a season best with 13 steals. But if there’s not take-your-breath-away specials in a Bulls game, there’s certainly beauty for the lover of the game. There’s beauty in life in the most unexpected places, in spirituality, in emotion, in Augustin recognizing a Butler mismatch and throwing over the top as Butler seals his man for an easy score. That particular one kept the Bulls ahead late in the second quarter, and though the Hawks would periodically threaten in the second half, the Bulls inevitably would pull away each time with the most fundamental of actions. Like Carlos Boozer digging out interior space coming out of a timeout for an easy score on the inbounds pass after the Hawks pulled within 60-57 early in the third quarter; like earlier when Augustin ball faked to draw the defense and fired into the corner for a Mike Dunleavy three; or Hinrich driving in, kicking the ball to Dunleavy who then wheeled it out to Butler for a better open three; or when Butler early in the fourth quarter dropped in a pass to a diving Noah for a score; or Taj Gibson with one of his regular power dunks as Noah drew the defense with a move and laid the ball off to Gibson. These are the subtle beauties of the game, more common and familiar to the Bulls now in playing their best of the season. They aren’t always particularly dominating wins or games that leave you mesmerized with the memories, though Augustin did have a few drives that sparked behind Rose-colored glasses. They are the games of men at work, which the Bulls have been the last month or so with a solid, reliable rotation, good health with their main players and a growing comfort in their actions and reactions, that when someone wants to make the pass the other guy is ready and waiting. It might not be a game that draws a nickname, but it’s fulfilling to watch and even more so to play. It’s both clinic and clinical. That Hinrich/Augustin duo has been integral in the fourth quarter when Thibodeau goes with Noah, Gibson and Butler in a quintet that has been the Bulls strength going down the stretch in games. 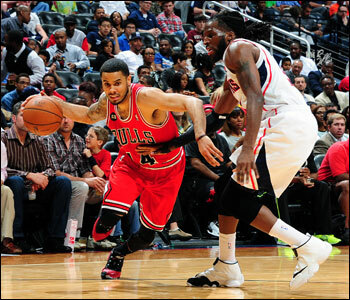 Augustin even has emerged as the team’s leading scorer with Derrick Rose out and Luol Deng traded. Jimmy Butler and the Bulls still remain tied with Toronto for third in the Eastern Conference and two and a half games ahead of fifth place Brooklyn. That tight rotation has held leads and made comebacks with all the elements that Thibodeau emphasizes each day and these players produce on the court. It may be repetitive for them, but those habits are what lead to success. It’s the alchemy from the Thibs lab that has suddenly made the Bulls an intriguing playoff threat. Everyone knows their defense with their big men inside, but also players like Noah and Gibson who can switch and defend the trickiest guards and Butler who can match the league’s top scorers. And there’s been a developing offensive element—the Bulls making 12 of 25 threes Wednesday—with Augustin again having a big scoring game after a career high 33 points earlier this week. Not enough. 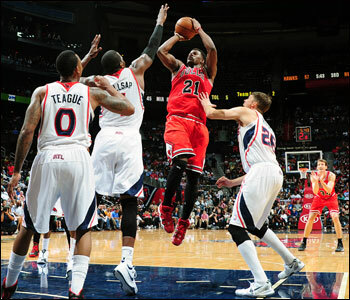 The hawks got 22 points and 11 rebounds from Paul Millsap and 21 points and eight assists from Jeff Teague. Kyle Korver was four of six on threes and Elton Brand started the second half at center and shot four of five. And then they tried to stop Augustin. And still Augustin was special, pump faking his way into early three-point plays after Atlanta led 40-35 early in the second quarter, Augsutin’s 14 second quarter points punctuated with a Magic Johnson-like ball fake, now-you-see-it-now-you-don’t drive, show and then score that rallied the Bulls from a loose 31-31 first quarter to a 57-49 halftime lead, after which the Bulls never trailed. Thibodeau didn’t hesitate on what it meant. Augustin was four of eight on threes while Butler was three of eight and Tony Snell added two with Butler in early foul trouble. It’s made the humble Augustin one of the surprising stories of the league. Not only to find a place in a rotation after being released but to become such an invaluable component. Usually grim faced and unemotional, even Augustin has been feeling the thrill of the chase Wednesday with a couple of exuberant gestures to the crowd, albeit sparse, one a fist pump on a three-point play late in the third quarter to make it 76-70 Bulls and performing a little bunny hop with a pull up three to effectively put it away at 96-87 with just over three minutes left. “Especially when you have a guy like Joakim in the huddle getting you hyped, you have no choice but to be the same way,” said Augustin. Augustin has done that and more, though in concert with the basketball orchestra of the Bulls. He’s hit some high notes, but he knows there’s no meaningful sound without everyone performing together. Noah got on himself a little bit, which also shows the discipline and maturity of the group. He argued with the officials a few times, though didn’t get called for a technical. Still, he was apologetic. Not necessarily to the casual observer, though that is the beauty of what the Bulls have going now. They’re playing together, playing as one and playing for all. It’s been a ball.